This crunchy roasted broccoli salad with pine nuts and feta is full of flavor in every bite! This salad provides a unique taste with the subtleness of the oregano and feta cheese. With so many fantastic ingredients in this broccoli salad…this one will quickly become a family favorite! I feel like I’ve been talking a lot about the weather here lately on my blog but ya’ll, I can’t help it. It’s just so gorgeous here in Arizona right now! You have no idea…well unless you live here, of course. When it starts warming up outside, I get inspired to make new springtime recipes and this one is perfect right now for our Arizona weather! It’s still chilly outside at night, but during the day it’s nice and warm in the direct sunlight. This broccoli salad with pine nuts and feta cheese is perfect for the beginning of spring weather because of the ingredients in the salad. Let me explain that concept so I don’t confuse you. The hint of oregano is a more robust tasting spice, which is perfect for cooler weather. When you pair oregano with the roasted pine nuts and feta cheese, it makes for a spicier, more full taste on the palette. The nutmeg in the homemade dressing also helps pull in that winter taste. You know what I’m talking about, right? Ok, but then I confuse things by adding in the crispy kale, crunchy broccoli stems and dried cranberries. I swear this salad starts screaming, “take me to a picnic!” And how pretty is this salad? I mean, look at those colors in the broccoli, kale and dried cranberries! I may just go make me a bowl to eat while I finish writing up this blog post! This recipe is really easy to make and it is inspired by Taylor Farms. I just love their healthy and fresh vegetables! 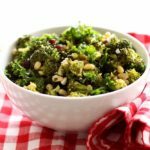 I started out making this broccoli salad by combining the raw broccoli, pine nuts, avocado oil and oregano in a large bowl until all the ingredients are well coated. I baked the broccoli mixture on a silipat (you can use a lined cookie sheet) in the oven on 425 for about 7 minutes; just long enough to let the broccoli, nuts, oil and seasonings warm up and nicely toast. Once the broccoli mixture is out of the oven, you’ll let it cool in a bowl on the countertop while you make the dressing. 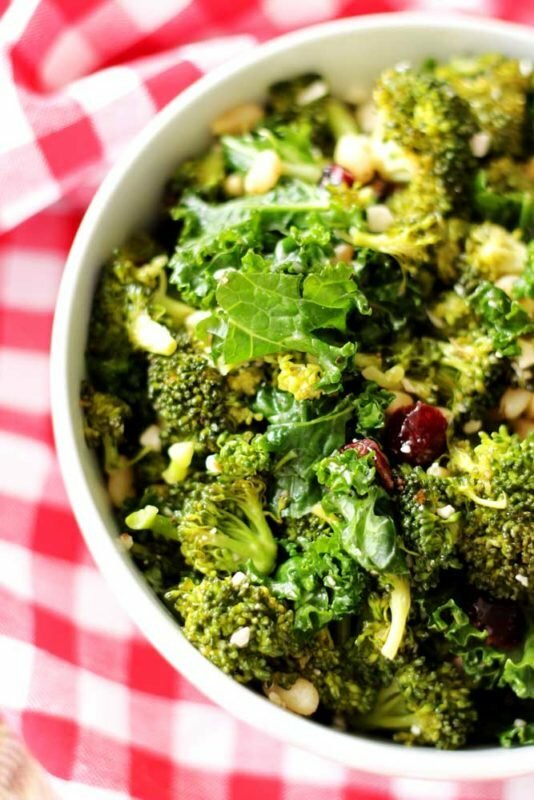 Once you whisk all the salad dressing ingredients together in a separate bowl, you’ll mix to coat with the broccoli salad ingredients including the fresh kale, feta cheese and dried cranberries. You’ll want to make sure your salad has completely chilled before you add in the dressing and the feta so the feta cheese doesn’t start to melt in the salad! From there, let this salad chill in the refrigerator for a couple of hours. Take advantage of this break…catch up on emails, watch a couple of your favorite shows. Kick those feet up and rest a bit! I do want to point out this is probably one of the only salads I’ve ever made that completely changes its taste when chilled. I was shocked at the taste difference in this chilled salad! It’s so yummy and full of flavor! I honestly can’t choose which ingredient makes this salad because they all pair so perfectly together! One of my favorite main dishes to pair this broccoli salad with is my 10 Garlic Clove Marinated Grilled Steak. You want to talk about a perfect dinner…go check that recipe out! You know me by now… yep, this broccoli salad is gluten free! All natural ingredients and super clean! 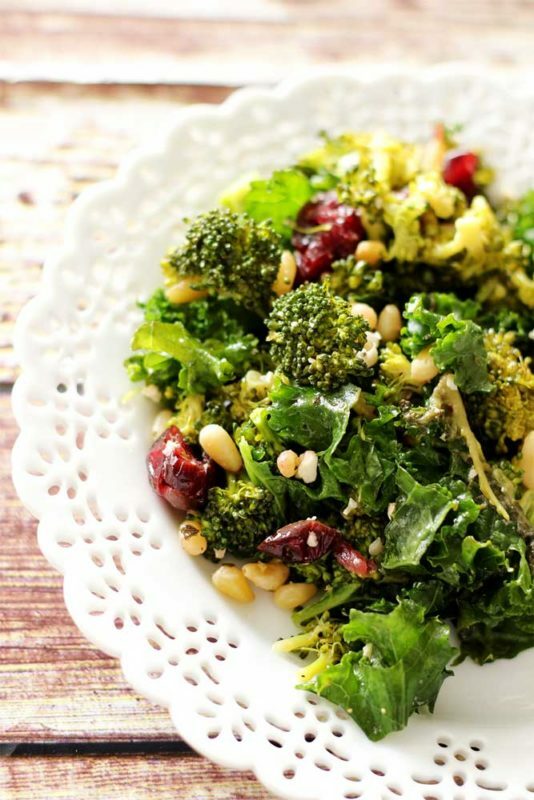 And this broccoli salad recipe is super simple to make. Don’t we all need a little more simple in our lives? I know I do! Enjoy this one and Happy Eats! This crunchy roasted broccoli salad with pine nuts and feta is full of flavor in every bite! This salad brings an Italian flare with the subtleness of the oregano and feta cheese. With so many fantastic ingredients in this broccoli salad...this one will quickly become a family favorite! 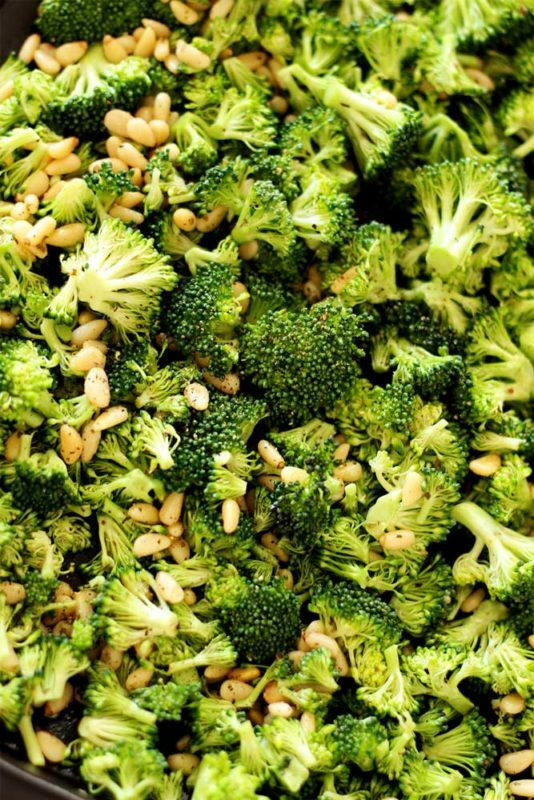 In a large mixing bowl, combine the raw broccoli, pine nuts, avocado oil and oregano until all ingredients are mixed well. Pour the broccoli mixture onto a silipat or cookie sheet lined with foil and roast in the oven for 7 minutes. Remove from oven and transfer broccoli contents to a bowl and set aside to cool for about 20 minutes. While the salad is cooling, go ahead and make the salad dressing. In a small bowl, combine the vinegar, olive oil, garlic, nutmeg and pepper. Whisk until well blended and set aside. 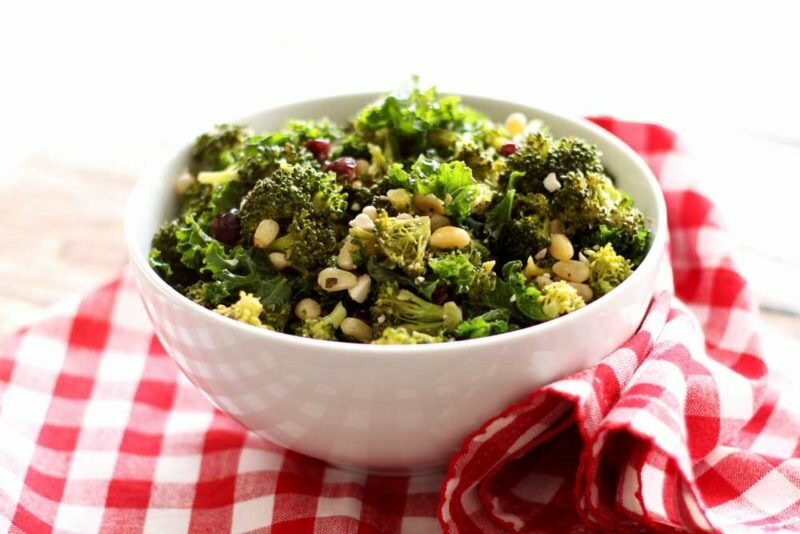 Once the salad is cool, mix in the fresh chopped kale, dried cranberries and feta cheese into the large bowl of broccoli mixture. Toss the salad with the desired amount of dressing. Chill the salad in the refrigerator for at least 2 hours before serving. 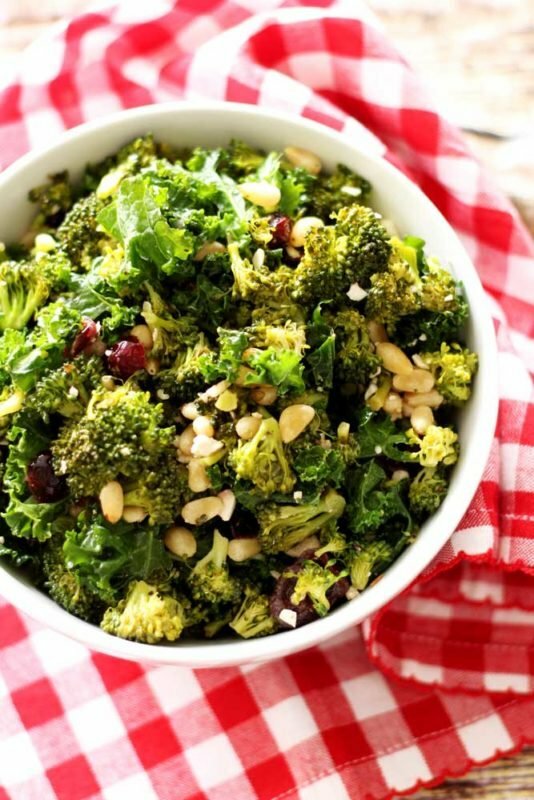 Pin this Roasted Broccoli Salad with Pine Nuts and Feta on your favorite Salad Pinterest board!! Love all that dark green! And the addition of pine nuts. This sounds amazing! It’s really great and full of nutrition!! we love cooking with pine nut as well. Topping for our pilaf, salad, and some other sweets. your salad looks perfect and delicious. You had me at pine nuts and feta!! Pinning this to make ASAP – makes me especially excited for when that spring produce starts to become more plentiful again! I’m officially jealous of your beautiful weather AND your sunny sounding dish! Here in Oregon it’s just rain, rain, rain. Here’s hoping your salad can bring a little sunny flavor to our table if not to our weather. I know – it’s absolutely beautiful here! !